There is a subreddit /r/nononoyes for videos of things that look like they’ll go horribly wrong, but amazingly turn out ok.
[ -z $var ] would belong there. It’s a bash statement that tries to check whether the variable is empty, but it’s missing quotes. 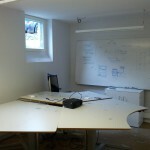 Most of the time, when dealing with variables that can be empty, this is a disaster. These issues are due to a combination of word splitting and the fact that [ is not shell syntax but traditionally just an external binary with a funny name. See my previous post Why Bash is like that: Pseudo-syntax for more on that. When the variable is empty and unquoted, it’s removed, and we pass 1 argument: the literal string “-n”. Since “-n” is not an empty string, it evaluates to true when it should be false. When the variable contains foo bar and is unquoted, it’s split into two arguments, and so we pass 3: “-n”, “foo” and “bar”. Since “foo” is not a binary operator, it evaluates to false (with an error message) when it should be true. It performs a completely wrong and unexpected action for both empty strings and multiple arguments. However, both cases fail in exactly the right way! In other words, [ -z $var ] works way better than it has any possible business doing. This is not to say you can skip quoting of course. For “foo bar”, [ -z $var ] in bash will return the correct exit code, but prints an ugly error in the process. For ” ” (a string with only spaces), it returns true when it should be false, because the argument is removed as if empty. Bash will also incorrectly pass var="foo -o x" because it ends up being a valid test through code injection. The moral of the story? Same as always: quote, quote quote. Even when things appear to work. ShellCheck is aware of this difference, and you can check the code used here online. [ -n $var ] gets an angry red message, while [ -z $var ] merely gets a generic green quoting warning. 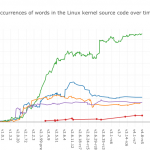 If you’ve followed discussions on Linux, you may at some point have bumped into a funny graph showing how many times frustrated Linux kernel developers have put four letter words into the source code. Today, for the first time in 12 years, it’s gotten a major revamp! You can now interactively plot any words of your choice with commit level granularity. Want to see the rise of ARM? How about a major victory in the war against misspelling “receive”? Is the nastiest four letter word you know “goto”? When did Ingo Molnar become active in Linux development? Did you find any interesting insights? Post a comment! tl;dr: dd works for reading and writing disks, but it has no advantages and some disadvantages over just treating the disk as a regular file. In many commands it’s entirely pointless. Usage of dd in this context is so pervasive that it’s being hailed as the magic gatekeeper of raw devices. Want to read from a raw device? Use dd. Want to write to a raw device? Use dd. This belief adds complexity to simple commands. How do you combine dd with gzip? How do you use pv if the source is raw device? How do you dd over ssh? People cleverly find ways to insert dd at the front and end of pipelines. dd if=/dev/sda | gzip > image.gz, they say. dd if=/dev/sda | pv | dd of=/dev/sdb. In both these cases, dd serves no purpose. It’s purely a superstitious charm trying to ensure safe passage of the data. It’s like cat /dev/sda | pv | cat > /dev/sdb except not as efficient. The fact of the matter is, dd is not a disk writing tool. Neither “d” is for “disk”, “drive” or “device”. It does not support “low level” reading or writing. It has no special dominion over any kind of device whatsoever. dd just reads and writes file. On UNIX, the adage goes, everything is a file. This includes raw disks. Since raw disks are files, and dd can be used to copy files, dd be used to copy raw disks. Meanwhile, cat is free to choose its buffer size that best serves a modern system, and the GNU cat buffer size has grown steadily over the years from 512 bytes in 1991 to 131072 bytes in 2014. ./src/ioblksize.h in the coreutils source code has benchmarks backing up this decision. However, this does not mean that dd should necessarily be categorically shunned! The reason why people started using it in the first place is that it does exactly what it’s told: no more and no less. If an alias specifies -a, cp might try to create a new block device rather than a copy of the file data. If using gzip without redirection, it may try to be helpful and skip the file for not being regular. Neither of them will write out a reassuring status during or after a copy. dd, meanwhile, has one job*: copy data from one place to another. It doesn’t care about files, safeguards or user convenience. It will not try to second guess your intent, based on trailing slashes or types of files. However, when this is no longer a convenience, like when combining it with other tools that already read and write files, one should not feel guilty for leaving dd out entirely. This is not to say I think dd is overrated! Au contraire! It’s one of my favorite Unix tools! dd is the swiss army knife of the open, read, write and seek syscalls. It’s unique in its ability to issue seeks and reads of specific lengths, which enables a whole world of shell scripts that have no business being shell scripts. Want to simulate a lseek+execve? Use dd! Want to open a file with O_SYNC? Use dd! Want to read groups of three byte pixels from a PPM file? Use dd! It’s a flexible, unique and useful tool, and I love it. My only issue is that, far too often, this great tool is being relegated to and inappropriately hailed for its most generic and least interesting capability: simply copying a file from start to finish. * dd actually has two jobs: Convert and Copy. A post on comp.unix.misc (incorrectly) claimed that the intended name “cc” was taken by the C compiler, so the letters were shifted in the same way we ended up with a Window system called X. A more likely explanation is given in that thread as pointed out by Paweł and Bruce in the comments: the name, syntax and purpose is almost identical to the JCL “Dataset Definition” command found in 1960s IBM mainframes. Remember this dialog from when you installed your distro? Most distros have a step like this. If you don’t immediately recognize it, you might have used a different installer with different wording. For example, the graphical Ubuntu installer calls it “Encrypt the new Ubuntu installation for security”, while the text installer even more opaquely calls it “Use entire disk and set up encrypted LVM”. 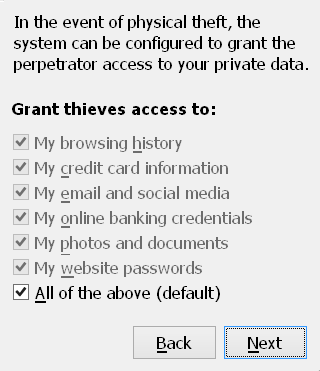 Somehow, some people have gotten it into their heads that not granting the new owner access to all your data after they steal your computer is a sign of paranoia. It’s 2015, and there actually exists people who have information based jobs and spend half their lives online, who not only think disk encryption is unnecessary but that it’s a sign you’re doing something illegal. I have no idea what kind of poorly written crime dramas or irrational prime ministers they get this ridiculous notion from. The last time my laptop was stolen from a locked office building. 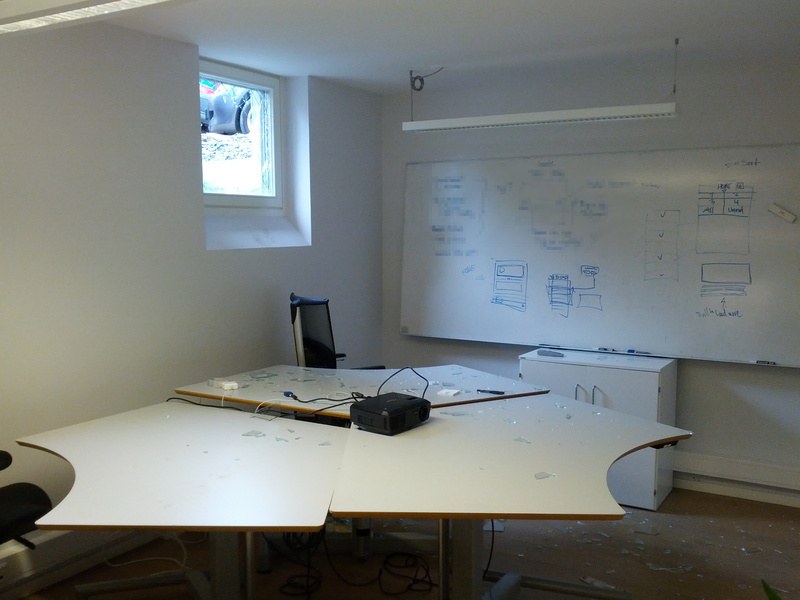 Here’s a photo from 2012, when my company laptop was taken from a locked office with an alarm system. Was this the inevitable FBI raid I was expecting and encrypted my drive to thwart? Or was it a junkie stealing an office computer from a company and user who, thanks to encryption, didn’t have to worry about online accounts, design documents, or the source code for their unreleased product? Hundreds of thousands of computers are lost or stolen every year. I’m not paranoid for using disk encryption, you’re just foolish if you don’t.